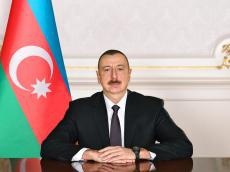 Azerbaijani President Ilham Aliyev has sent a congratulatory letter to Custodian of the Two Holy Mosques, King of Saudi Arabia Salman bin Abdulaziz Al Saud. "On my own behalf and on behalf of the people of Azerbaijan, I sincerely congratulate you and through you all the people of your country on the occasion of Saudi National Day. On this festive day, I wish you good health and happiness, and the brotherly people of Saudi Arabia lasting peace and prosperity", Ilham Aliyev said in his letter.